Brocktober rolls on, as the Dolphins have announced that Brock Osweiler will be under center Sunday’s game against Detroit, his second straight start after replacing Ryan Tannehill, who was a game-day scratch with a shoulder injury in Week 6. What exactly Tannehill’s injury is, and how it got so bad so suddenly, is something the NFL is now investigating. Coach Adam Gase got snippy in his postgame presser when asked for details about Tannehill. He cited HIPAA as a reason he couldn’t answer, which is obviously BS, because otherwise there’d be about eight dozen HIPAA violations in the NFL each weekend. Teams talk about injuries all the time. There’s another reason Gase might not want to explain how Tannehill got here. Tannehill was sore on Monday, and got treatment and felt better. Same thing on Tuesday. [K]nowing their quarterback’s throwing shoulder was sore, the Dolphins trotted him out for a full practice on Wednesday. And after he got a little worse because he was no longer resting the affected area, the team trotted him out for a full practice (the most intense throwing practice of the week) again on Thursday. Keep in mind that one week later the Dolphins have decided the best course of treatment is to have Tannehill rest and rehab his shoulder so that he can regain his full range of motion and strength back. Somewhere in here, Tannehill went for an MRI. We don’t know what it shows, but Tannehill practiced again on Friday, though he didn’t throw as much as he had in the previous days. Listed as questionable for Sunday’s game, Tannehill was in such bad shape for a pre-game workout that he was benched and Osweiler started in his place. As Salguero notes, the best-case scenario here—and the above timeline is the one the Dolphins have put out there— is that for an injury the Dolphins now recognize requires rest, Miami sent Tannehill out for full practices, even after it had started to worsen. Things get even more complicated, though. Salguero reported yesterday that the NFL is investigating how the Dolphins publicly reported Tannehill’s injury. He was initially listed as having been a full participant in practice on Thursday. But Gase later let slip that Osweiler had taken some first-team reps in that Thursday practice, which, per NFL rules, means Tannehill should have been listed as “limited.” He wasn’t. The NFL also wants to know why Tannehill was listed on the injury report as “questionable” for Sunday’s game (roughly a 50/50 chance to start), when it was widely reported (and widely acted upon by bettors) that Tannehill was realistically doubtful to play. So it’s back to Brock, who led Miami to an overtime win over the Bears, and, since the Dolphins have a short week coming up, is likely to start a third game, in Week 8 against the Texans on Thursday. 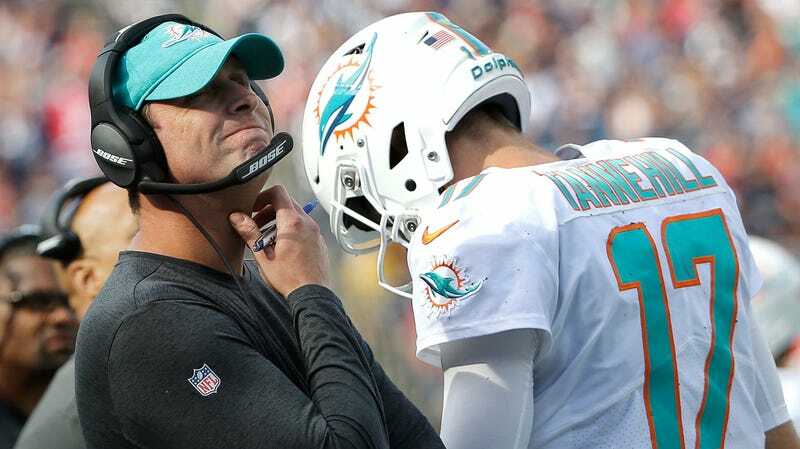 But Gase is far from done with being asked what he knew about Ryan Tannehill’s bum shoulder, and when, and why he allowed it to get worse.